Zebre ended Edinburgh's winning start to the season with a hard-fought win at Stadio Sergio Lanfranchi. Fourteen points from the boot of stand-off Carlo Canna, and a try for wing Dion Berryman helped the hosts to a first victory in 11 league matches. 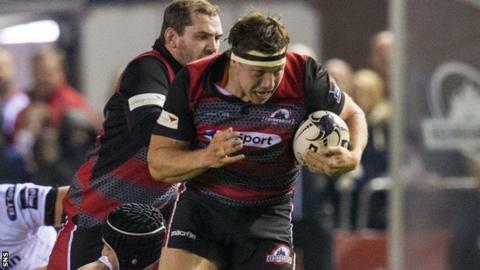 Flanker Hamish Watson scored his second try in as many matches for Edinburgh, with scrum-half Nathan Fowles kicking two penalties. But the eight-point margin of defeat denied the visitors a bonus-point. Canna and Fowles traded early penalties, before the Italia international - who featured from the bench in all four of the Azzurri's Rugby World Cup pool fixtures - struck twice more from the tee before the break. Fowles missed with his second attempt, but replied in kind soon after as Zebre infringed. Lively openside Watson, in sparkling form for Edinburgh in last Friday's victory over Ulster, capitalised on powerful carries from back-row colleague Nasi Manu and prop Rory Sutherland to cross. Fowles failed to convert, but Alan Solomons' side held a two-point advantage at the interval. Canna sliced a penalty attempt wide on 56 minutes, but it was not long before Zebre regained the lead, New Zealander Berryman touching down by the uprights after heavy pressure on the Edinburgh line. With 20 minutes remaining, Canna handed the hosts a two-score cushion, slotting his fourth penalty and taking the scores to 19-11. Edinburgh had not beaten Zebre in Parma since March 2013, and with their winning early-season run at stake, they pressed hard to reduce the arrears, Watson coming closest to scoring again before the visitors went off their feet at the breakdown. Sam Hidalgo-Clyne, a half-time replacement for Fowles, sent a late penalty wide, with fellow substitute Blair Kinghorn, making his club debut, dropping a long-range effort from the tee just short in the final play as Alan Solomons' side chased a losing bonus-point in vain. Edinburgh now sit fourth in the Pro12 standings, while Zebre's victory allowed them to leapfrog Italian rivals Treviso into 11th. Zebre: Van Zyl, Berryman, Visentin, Pratichetti, Sarto, Canna, Violi; Lovotti, Manici, Chistolini, Geldenhuys, Biagi, Cook, Meyer, Van Schalkwyk. Replacements: Fabiani, De Marchi, Ceccarelli, Bernabo, Sarto, Burgess, Palazzani, Padovani. Edinburgh: Cuthbert, Brown, Helu, Strauss, Hoyland, Burleigh, Fowles; Sutherland, Cochrane, Andress, Bresler, McKenzie, Coman (captain), Watson, Manu. Replacements: Turner, Dell, Berghan, Toolis, Du Preez, Hidalgo-Clyne, Fife, Kinghorn (uncapped).